Well, needless to say... we need more room! Summer 2010 we lost two chickens to the intense heat that Kansas had ~ I am pretty sure our cute little coop, is just too small and it got too hot in there. We started with some extra lumber we had sitting around and I did some shopping at Habitat for Humanity store for doors, windows, etc. I came home with some super cute garage sale finds too! 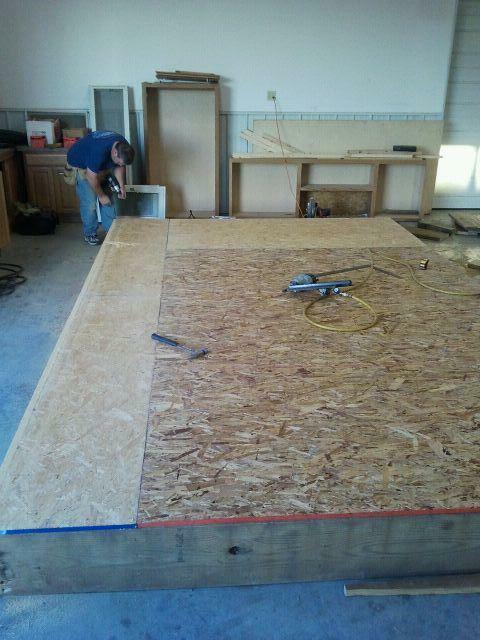 I even found some OSB on Craigs list one week, just when we needed it! My husband began working on the flooring inside the shop and since we had that wood laying around, we decided to use it ~ even though it was WAY over doing it! You can drive on truck on this flooring! 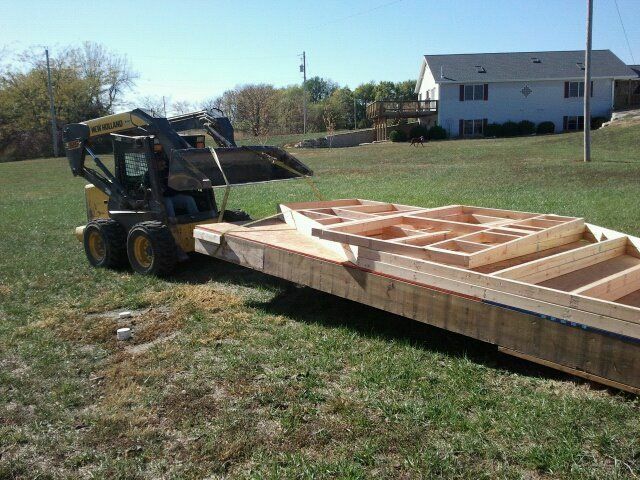 It ended up weighing so much we had to re-plan how we were moving it out to the site! 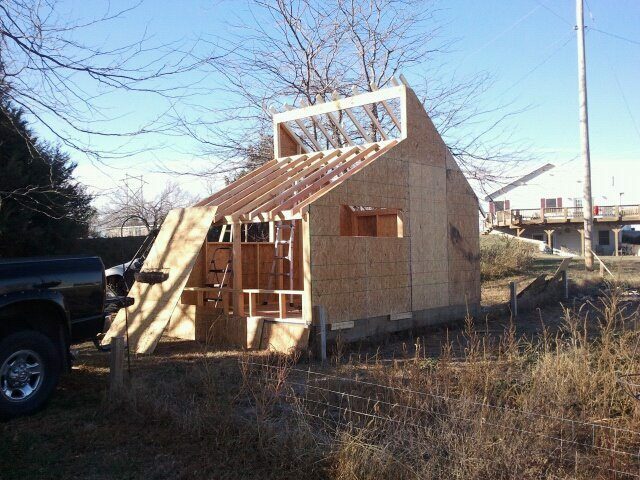 But it will take one LARGE Kansas tornado to flip this hen house!! We followed the design of the open air coops found on BYC but made up our own dimensions and plans, based on the 10x16 sq footage we were using and the windows I found. 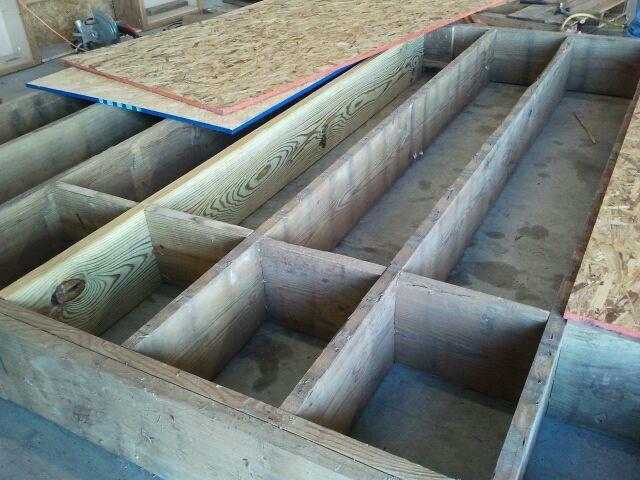 We got the floor built inside our shop and pulled it out to the spot next to the garden. 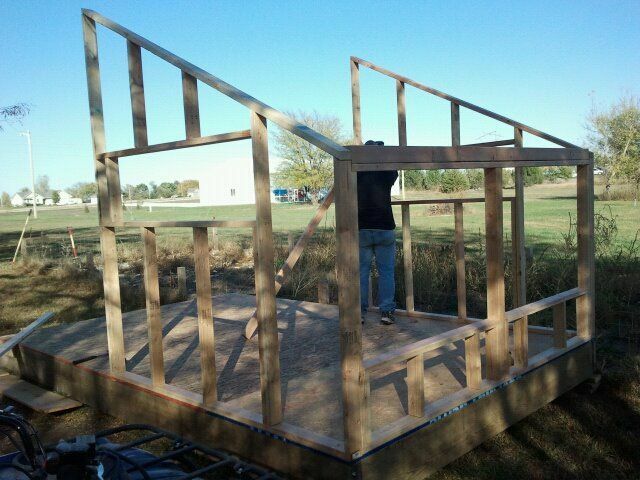 My plan is: during the Winter months our panels will be up around my garden spot and the chickens will fertilize it. In Spring when I get ready to plant, we'll move the panels to the other side of the Hen House and they will have a new area to play in! And my garden will be fully fertilized and ready to till up! PERFECT for me too since I can toss veges and things to them right there! 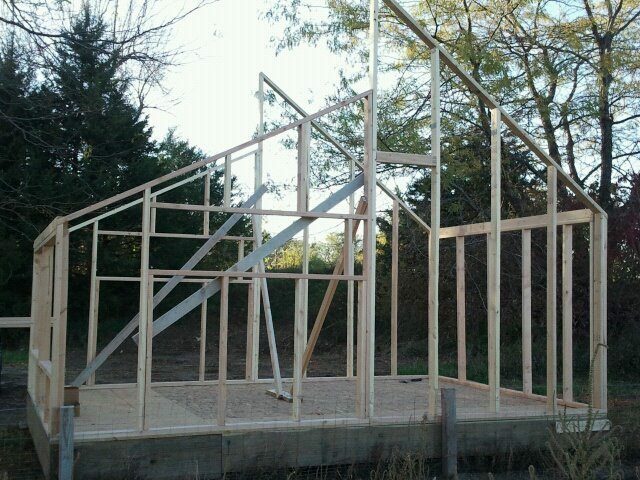 Over the next few weekends we got the walls up (that we had built in the shop but waited to put up until we got the base out to the sight)... and we got OSB sheeting put up on it. 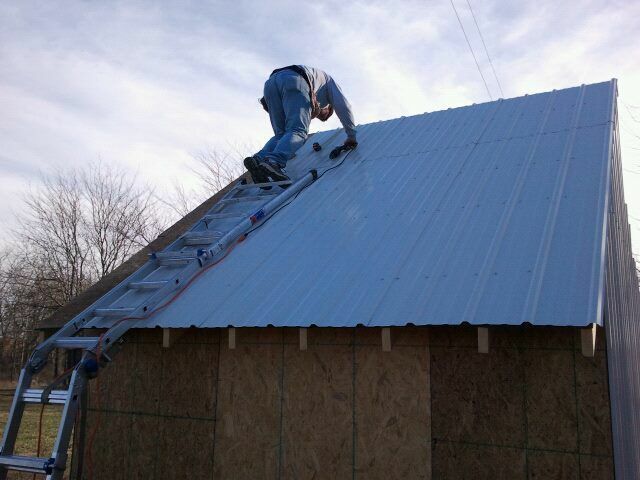 We then started the metal siding and roofing. Although it won't be red with white trim (which I think is AWESOME) it will go better with our house and shop as a grey/white building. 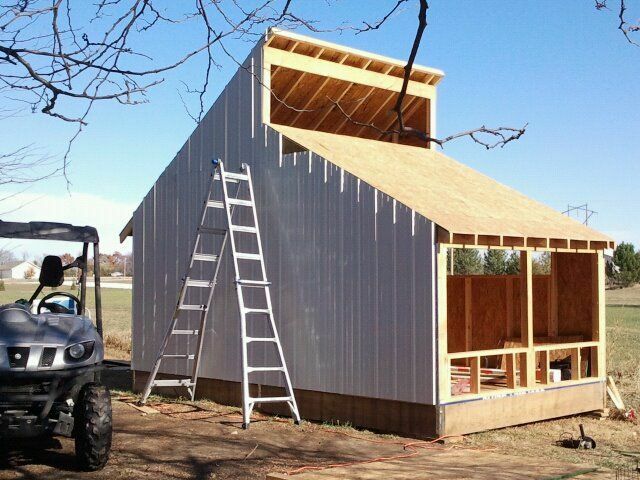 Can't wait to get it finished before the snow flies ~ only leaving us a few more weekends I think! 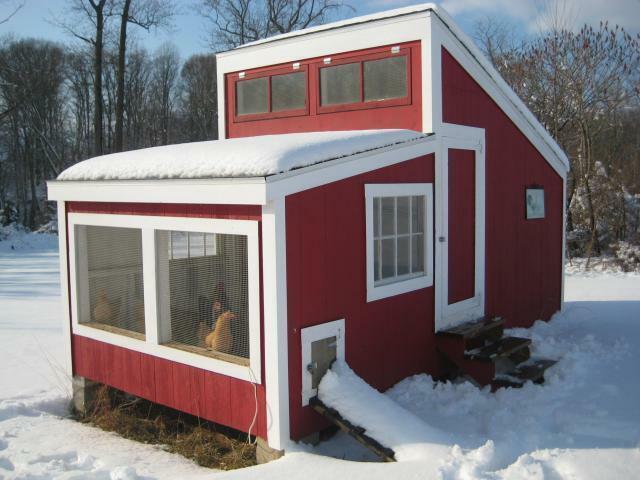 This is the garden side of the coop - Front open panels are facing South. Need to cut the window holes out and get our door and top windows framed in. Then hardware cloth goes on the two large front openings.